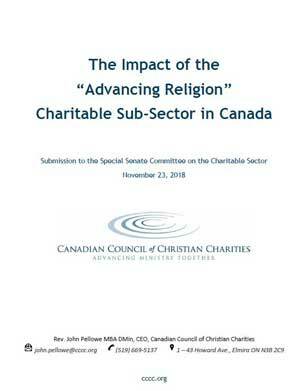 CCCC submitted a written brief to the Special Senate Committee on the Charitable Sector in November detailing the well-researched benefits of advancing religion to the general public. In the brief, CCCC asked the senate committee to affirm Advancing Religion as a charitable purpose with significant public benefit to Canadian society. Rev. John Pellowe, CEO of CCCC, has been invited to speak to the senate commiittee at 11:00 AM Monday, March 18 with a special emphasis on how even non-religious people benefit from religious charities. The presentation will be followed by a time for Q&A with the senators. CCCC asks for your prayers as we make the case for why religious organizations should have charitable status.